We car reviewers tend to rave about the MX-5, and with good reason. Contrary to its detractors’ claims that this is a “girl car” (whatever that even means), this tiny two-seater is one of the most fun-to-drive cars you’ll find in any price range. 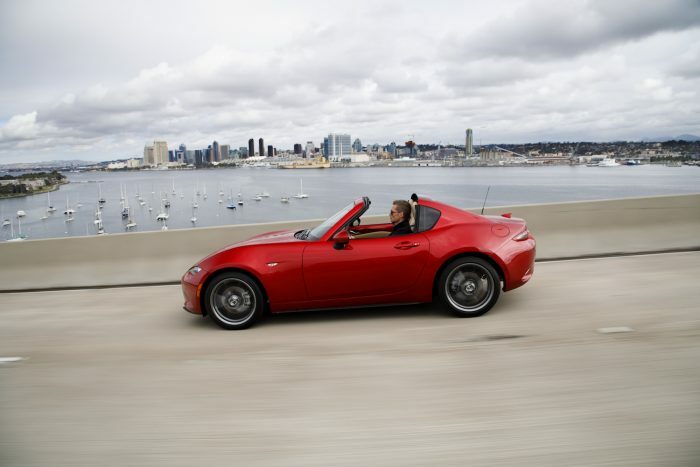 Introduced to unsurprisingly positive reviews as a 2016 model, the fourth generation of Mazda’s MX-5 proved that a bit of refinement wouldn’t dampen this little roadster’s fun factor. And now, for 2017, Mazda has amped up the car’s upscale feel even further by bringing back the folding hardtop option last offered in 2015. Sticking a folding rigid roof on a convertible is not a new concept: Mercedes-Benz was among the first to market with one in the original SLK Class of the late 1990s. What Mazda has done differently with its new MX-5 RF is leave the rear section in place whether the top is up or down. Somehow, rather than interrupting the flow of the design, that detail makes an already pretty car even more of a stunner. The new roof creates more flowing lines to give the MX-5 a striking look, evidenced by all the attention our test car garnered from pedestrians and other drivers, especially with the top stowed away. The MX-5’s standard soft top is a manual affair the driver (or front passenger) can raise or lower from their seat in less than 10 seconds. In the RF, it takes about 15, but the process happens automatically at the press of a toggle in the centre console. Counterintuitively, you flip the switch up to the put the top down (and vice versa), and a motor moves that buttress section up and back, revealing the space into which the centre section and back window disappear. It’s a neat piece of engineering that leaves trunk space untouched, which is good, because there isn’t much of it to begin with. Likewise the cabin, which is best suited to people on the slim and short side of average, and in our test car, that was reinforced by heavily-bolstered Recaro seats that come as part of the $4,400 sport package, which also brings Brembo front brakes with painted calipers and 17-inch lightweight wheels. There is also a dearth of storage space in the cabin. There’s a small cubby ahead of the shifter where small- to medium-sized smartphones will fit, and a shallow compartment under the central armrest, while the glovebox lives between the seatbacks to free up front-passenger knee room. If you and your stuff can get comfortable in in the MX-5’s cabin, you’ll be treated to what we think is one of the best driving experiences you can get for less than $50,000. Quick and direct steering works with a sharp chassis to deliver effortless, well-balanced cornering that combines with a surprisingly comfortable ride to make this roadster an easy-going daily driver. Mazda’s 2.0-litre four-cylinder engine makes 155 hp and 148 lb-ft of torque, figures that won’t take your breath away either on paper or the road. But we like it, because that modest output makes it difficult to get into trouble even when driving this car as enthusiastically as it was designed to be used. 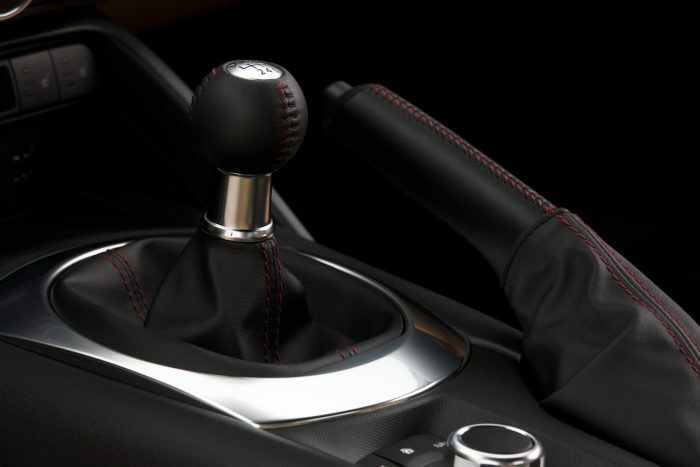 The engine is happy to rev, and if the six-speed manual shifter isn’t the most buttery-smooth gearbox around, it has a pleasingly mechanical feel to it that’s absent from many other sporty cars. As easy as this car is to live with day-to-day, we’d hesitate to use it regularly for long-distance highway travel. With the top up, the RF was noisier at speeds above 60 km/h than we remember from the soft-top version, thanks to the hard roof reflecting more mechanical sounds than the base model’s fabric roof. And for those obsessed with facts and figures, another consideration is the 56 kg the RF’s roof mechanism adds. Mazda says it doesn’t affect the MX-5’s fuel consumption estimates (8.9/7.1 L/100 km in city and highway driving respectively; our tester averaged 8.0 in city driving), but it’s enough of an increase to make a small dent in economy over time. But before you live with a car, you have to buy it, and the MX-5 RF GS’s $38,800 CAD starting price is a $3,000 premium over the cloth-top GS, and nearly $8,000 more than the GX soft-top, the only way you can get that entry-level trim. Any way you slice it, this car is expensive for what it is. For less than another $10,000 over our MX-5’s as-tested price, you could get into a much quicker and roomier Nissan 370 Z convertible, never mind the coupe version of that car that comes in less expensive than a base MX-5. And yet, every time we drive this smallest Mazda, we come away completely and utterly charmed by its simplicity and the sheer joy to be had in being able to drive it flat-out in almost any situation and still have to work to attract the attention of law enforcement. Ultimately, simplicity is what makes the MX-5 special, and as impressed as we are with the engineering Mazda put into this newest folding hardtop, we would happily stick with the fabric roof and do a little of the work ourselves. Four months since its official debut in New York, pricing for the 2018 Jeep Grand Cherokee Trackhawk is now set, starting at $85,900 US.